In the documents I read SWE 037 raced as 5.5 in Travemunde's trials fro new olympic keelboat, as comparison. I disagree. The boat that raced in Travemunde was a Luder's design named "John B" helmed by B. Simonette; irrespective of the boat's name the sail number shown in Travemunde was BA 1. 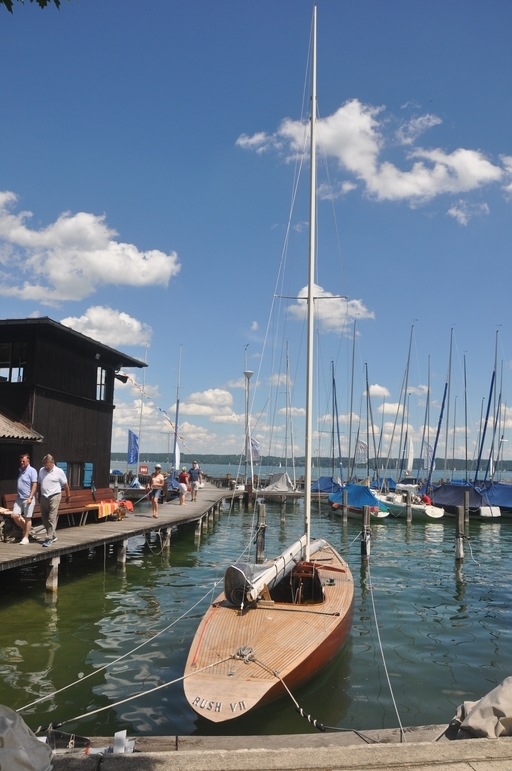 "Rush VII" has undergone a refit process during wintertime and owner & crew are now eagerly waiting to race against her 1964 Olympic rival "Subbnboana", which is also based on the Lake of Starnberg. Additionally it is planned to arrange race meetings with the other "Enoshima boats" during this season. Silver medal (2nd/15) at the XVIII Olympics 1964 Tokyo, Japan, Lars Thörn / Sture Stork, Arne Karlsson, Rush VII, S-37, E. & C-E. Ohlsson 1963, 4-4-4-4-1-4-1, 5254p.